A few years ago I decided to take a break from writing this my column for the Tennis Server. It was a very busy time for me personally and professionally and I just didn't feel as if I could give the column the time it, and particularly you, deserved. So, I wrote a final, wrap-up piece thanking all of you for your kindness in reading, and often responding, to my articles. I've always enjoyed the communication from our readers and knew it was something I'd miss. What I didn't expect was the great number of you who wrote to thank me for my columns and tell me how much they had helped you on, and sometimes off, the court. Among the notes I received, many asked where they would be able to continue to read my work and, if I'd ever considered writing a book? Well, we all have moments in our lives that are aptly described as "life moments" and all of those notes combined to give me one. Write a book? There's something I'd never really thought of. I began to wonder if I could. 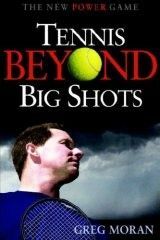 That was roughly four years ago and I'm happy to say that the thought that you first planted in my mind has resulted in the publication of my first book: "Tennis Beyond Big Shots." Writing my book from the first draft up through editing, finding an agent, a publisher and then bringing the book to the market has been an incredibly educational, enjoyable (sometimes frustrating) process that has truly been one of the most interesting experiences of my life. I have my Tennis Server readers to thank for giving me the courage to dip my feet into the water. Anthony Robbins is one of the world's foremost success coaches. He's written five books, created Personal; Power, the #1 personal and professional development system of all time (anthonyrobbins.com) and has worked with world leaders, major corporations and professional athletes such as Andre Agassi and Greg Norman. An expert in time management, Robbins trains his clients to break down time into distinct periods and teaches them to take control of each period and use it to their advantage. Tennis matches are made up of three distinct time periods: points, between points and changeovers. Taking Tony's advice and developing a strategy for each of these time periods will go a long way towards helping you win more matches. Paul Fein, in his brilliant book Tennis Confidential, wrote that in the 1991 Wimbledon final in which Michael Stich defeated Boris Becker, "the ball was actually in play for nine minutes and twenty seconds in the two and a half hour match. Granted the match was played on grass and Stich and Becker were two of the games biggest hitters but the fact remains that, during most tennis matches, the ball is actually in play less than 25% of the time. When you're in the middle of a point, you're running, stretching, hitting and trying to gain the advantage. You don't have time to think. Let the training and drilling you've done in practice take over. Focus on preparing early and hitting the ball cleanly to your targets. Keep your feet moving and patiently execute your patterns while waiting for an opportunity to take control of the point. To help yourself stay calm and maintain your patience when the ball's in play, come up with a mantra that you can recite to yourself. When I play matches, I'm constantly reciting the words "deep and smart" to myself as the ball moves back and forth across the net. This simple phrase keeps me calm and reminds me to focus on hitting my shots deep and play smart/percentage tennis. Find your own mantra and recite it to yourself during your points. The point has ended and you now have 25 seconds to get ready for the next. Tennis points can be extremely long and strenuous so, when the point ends, you need to first catch your breath and come down from the emotional stress of the point. Turn away from your opponent and walk to the back fence. Your mind will dwell on where your eyes focus so resist the urge to look around. Keep your vision within the confines of the court. Place your racket in your left hand and look down at your strings. Take 4-5 deep, controlled breaths and, as you push the air out, relax your neck and shoulders. Give yourself 5-10 seconds to recover. After you've caught your breath, take the next 5-10 seconds to relive the previous point. Observe, without emotion, why you won or lost the point. Give yourself two quick tips and then move on. For example, if your opponent beat you to the net and hit a winning volley, remind yourself to "aim higher over the net to keep the ball deep." If he made an error on his backhand side, remind yourself to "keep pounding the backhand." Keep it brief and simple, you don't have time for in-depth strategizing. With the remaining few seconds you need to gear yourself up for the next point. Bounce up and down on your toes. Take a long look at your opponent and give yourself a quick tip for your next shot. If you're serving, visualize where you'll place your serve. Say to yourself, "out wide" or "into the body." If you're receiving serve, tell yourself to "focus on the ball and block it back." During the changeover you have 90 seconds before the next game begins. Andre Agassi sprints to his chair as soon as the changeover begins. You should get there quickly as well. Like a boxer between rounds, sit down, towel off your arms, legs and neck. Sip your water, close your eyes and take five deep breaths. Use the first 20 seconds to physically and emotionally recover from the previous two games. Over the next 45 seconds, take a good look at what's happening at this point in the match. Review the last two games and pay attention to how you're winning and losing points. If your forehand's letting you down, figure out patterns that will bring more balls to your backhand. If you notice that your opponent's backhand is landing short in the court, plan a pattern that gets the ball to their backhand side. If you're tiring, tell yourself to shorten the points by coming to the net. Many times you'll be able to protect your weaknesses during the match however, you must also take note of those weak areas (physical, technical and psychological) so that you can work on them in practice. During the changeover also be sure to take note of your opponent's body language. Does he appear getting angry, frustrated or tired? If the answer is "yes," you're obviously getting to him so stick with the patterns you've been using. Most players will hit the same shots again and again in a given situation so remind yourself of tendencies. Where does he serve on big points? When you attack the net on his forehand side, does he try to pass you cross-court or down the line? Recognizing and reacting to these tendencies can often win you the match. I saw a great example of this recently when two players Bill and John faced each other in their club championship finals. Throughout the match, Bill had paid strict attention to John's patterns and noticed that on big points John hit his backhand passing shots cross-court. When the third set tiebreaker reached six points all, John had an easy backhand passing shot to win the match. Bill remembered his cross-court tendency and, just before John struck the ball, he moved to cover the cross-court shot. John stayed true to form, and Bill had an easy put away. Two points later, the same situation presented itself only this time Bill held the match point. Again, John ripped his passing shot cross-court and again Bill anticipated correctly and won the point--and the match. That little piece of information that Bill had picked up, and actually written down during a changeover, had won him the title. Finally, you need to plan your strategy for the next two games. If you're winning the match, don't change a thing. As the legendary Bill Tilden once said, "Never change a winning game." If you're comfortably ahead or the match is close, stick with your game plan. Bounce up out of your chair and be the first back on the court. Let your opponent see that you're eager to play. If you find yourself slightly behind, don't panic. Close matches are usually decided by a few points. Stick with your game plan. If you can win a few of those big points, you can easily turn the match in your favor. If you're getting blown off the court, slow the pace of the match down. Use every one of your 90 seconds. Let your opponent walk back onto the court first. Make him wait for you. Once play resumes, use the full 25 seconds between points. Just because your opponent may be on a hot streak for the first few games of the match, it doesn't mean that he can keep it up for the full two or three sets. By making him play to your pace, within the rules of course, you can often take them out of their rhythm and turn the match around. Seventy-five percent of a tennis match is spent not hitting the ball and the winner is usually the player who can more effectively devise, adjust and execute their strategy. If you can learn to win this game within the game you'll most likely be the one smiling at the end of the match.